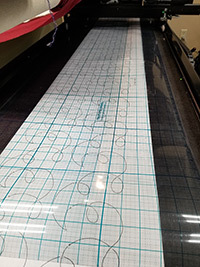 The PatternGridÂ® measures 18 inches by 12 feet, with 1 inch blocks and Â¼ inch dotted lines and is made of a 10 ml. rigid plastic. Kits include a wet erase marker, 8 oz spray bottle, ruler and cloth for wiping off your wet erase marker.